Hello dear reader! How is everyone doing? I had the most awesome day yesterday, Daphne from Nailswatches, Michelle from TheLacquerFiles and myself went nail polish hunting. It was so much fun! We visited a wholesale with lots of ChinaGlaze, and within expectations we all kinda went crazy ha! Anyway, for today I have another purple holo to show you! This is Original from the Designer Series by OPI, I don't think the color is as jaw-droppingly gorgeous as Color Club's Wild At Heart, which I showed you last week, but it's still pretty steamy, and definitely more holographic as well. 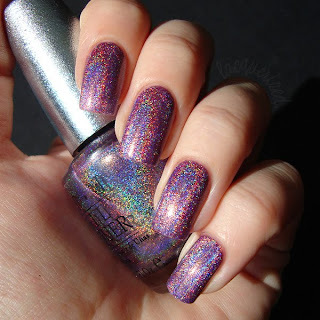 The holographic effect is a bit scattered, not as dense as the Nfu Oh holos for example, and that's just how I like it. Application was alright, nothing outstanding, 3 coats quickly dried to a perfectly smooth surface. What I like about these holos by OPI, it that they're quite shiny, so you can easily wear them without a top coat. Actually, they say these polishes from the Designer Series are infused with Diamond Dust. This is supposed to "reflect light in an explosion of brilliance", well I don't know if it's the diamond dust, but it's pretty sparkly. And diamonds are a girl's best friend, right?